The history of the U.S. current account balance in recent decades is presented in several different ways. Figure 1 (a) shows the current account balance and the merchandise trade balance in dollar terms. Figure 1 (b) shows the current account balance and merchandise account balance yet again, this time presented as a share of the GDP for that year. By dividing the trade deficit in each year by GDP in that year, Figure 1 (b) factors out both inflation and growth in the real economy. Figure 1. Current Account Balance and Merchandise Trade Balance, 1960–2013. 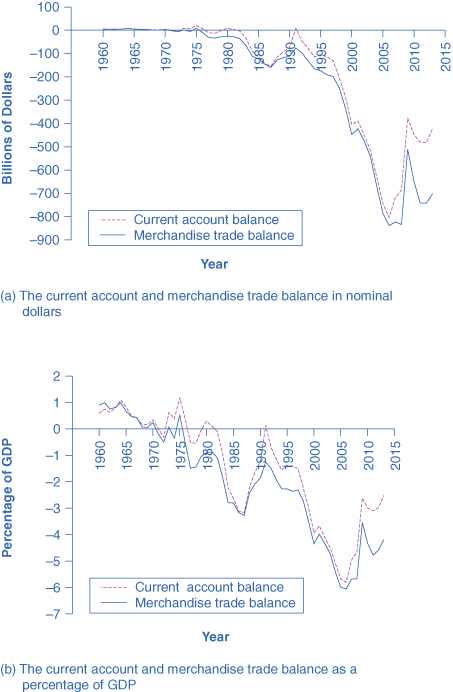 (a) The current account balance and the merchandise trade balance in billions of dollars from 1960 to 2013. If the lines are above zero dollars, the United States was running a positive trade balance and current account balance. If the lines fall below zero dollars, the United States is running a trade deficit and a deficit in its current account balance. (b) These same items—trade balance and current account balance—are shown in relationship to the size of the U.S. economy, or GDP, from 1960 to 2012. By either measure, the general pattern of the U.S. balance of trade is clear. From the 1960s into the 1970s, the U.S. economy had mostly small trade surpluses—that is, the graphs of Figure 1 show positive numbers. However, starting in the 1980s, the trade deficit increased rapidly, and after a tiny surplus in 1991, the current account trade deficit got even larger in the late 1990s and into the mid-2000s. However, the trade deficit declined in 2009 after the recession had taken hold. Table 4 shows the U.S. trade picture in 2013 compared with some other economies from around the world. While the U.S. economy has consistently run trade deficits in recent years, Japan and many European nations, among them France and Germany, have consistently run trade surpluses. Some of the other countries listed include Brazil, the largest economy in Latin America; Nigeria, the largest economy in Africa; and China, India, and Korea. The first column offers one measure of the globalization of an economy: exports of goods and services as a percentage of GDP. The second column shows the trade balance. Most of the time, most countries have trade surpluses or deficits that are less than 5% of GDP. As you can see, the U.S. current account balance is –2.3% of GDP, while Germany’s is 7.4% of GDP. The United States developed large trade surpluses in the early 1980s, swung back to a tiny trade surplus in 1991, and then had even larger trade deficits in the late 1990s and early 2000s. As we will see below, a trade deficit necessarily means a net inflow of financial capital from abroad, while a trade surplus necessarily means a net outflow of financial capital from an economy to other countries. In what way does comparing a country’s exports to GDP reflect how globalized it is? Canada’s GDP is $1,800 billion and its exports are $542 billion. What is Canada’s export ratio? The GDP for the United States is $16,800 billion and its current account balance is –$400 billion. What percent of GDP is the current account balance? Why does the trade balance and the current account balance track so closely together over time? In recent decades, has the U.S. trade balance usually been in deficit, surplus, or balanced? If a country is a big exporter, is it more exposed to global financial crises? Divide $542 billion by $1,800 billion. Divide –$400 billion by $16,800 billion. The trade balance is the difference between exports and imports. The current account balance includes this number (whether it is a trade balance or a trade surplus), but also includes international flows of money from global investments. 23.2 Trade Balances in Historical and International Context by Rice University is licensed under a Creative Commons Attribution 4.0 International License, except where otherwise noted.